Users with both Office 365 and Office 2010 installed, began complaining about this problem a few months ago, although it seems to be affecting more people since last week's updates. 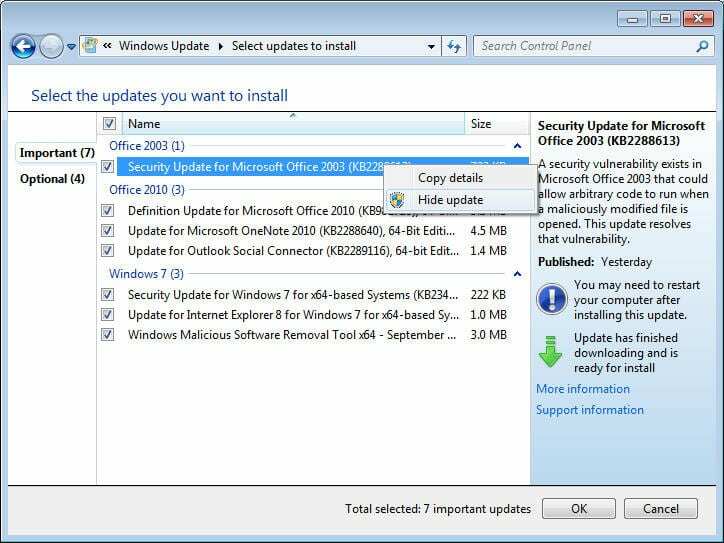 Or more people are keeping Office 2010 installed when they upgrade to Office 2013. When I open Outlook 2010, I get an error message: The internet fax service requires Outlook 2010. No matter how many times I dismiss it, it pops back up. This is triggered by KB 2794707. Removing this update should resolve the problem. Some users say they needed to uninstall KB2598374 too. To uninstall it, open the Control panel. If you are using Category view, click on Uninstall a Program; if using icons, choose Programs and Features. Sort by the Installed date and locate the update and uninstall it. Microsoft update will eventually reinstall it. 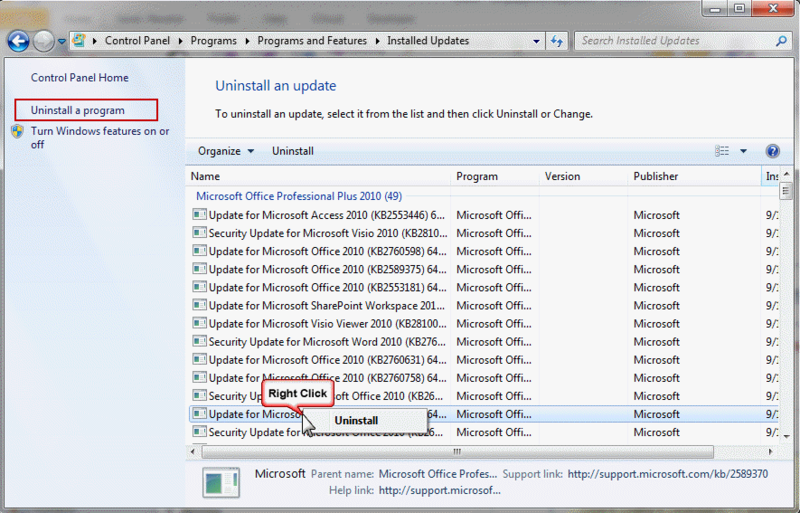 You can open Microsoft updates and hide the update, if desired. After you uninstall the problematic updates, Automatic updates will keep reinstalling the Update (unless Microsoft removes it from Automatic Updates). You need to go to the update site and hide this update. Go to the Start menu and click the link for Windows Update. Let it search for updates it thinks you need then review the list. Right click on the updates you don't want installed and mark it hidden. If the update is enabled (checked) for installation, hiding it will remove it from the installation list. Note: I highly recommend using the automatic install option for most users, experience tells me that most users will not install updates at all if they are not installed automatically. For this reason, I recommend hiding updates you don't want installed, not disabling automatic updates. However, you can change automatic update settings to download but let you choose whether to install. In Windows 7/8, go to Control panel, Windows updates and click Change settings. I thought I had Repaired O2010 after the Uninstall and before my query, but may have been mistaken. After I DID Repair it, the message went away and Outlook works fine. So tonight I Repaired O2010 on my wife's PC, which is configured similarly to mine and had been giving the same error message. It looks OK so far. And it still has KB 2794707 installed. Perhaps MS ought to publicise the Repair facility? I like it when simple fixes work. :) It's likely that future updates will include the "bug" that causes this, but one of the updates may also fix the problem. The normally release hotfixes, then a couple of months later, release an update (usually labeled 'cumulative update' that has the hotfix included. From that point forward, updates will include the hotfix. Hopefully you won't have to repair it after each update. I uninstalled and hid the offending update KB 2794707. That seemed to fix the problem... but a few days later, it's back: both the Internet Fax message and the failure to start Outlook. I have Office 2010 and 2013 installed, using Outlook 2010 because it can see my Gmail accounts and everything else 2013. Can't uninstall 2013 because I'm using its Visio and Project. Was the update reinstalled? Not that hiding it helps a whole lot, Microsoft will include it in a future update. Try repairing Office 2010 then repair Office 2013. That worked for some people. I've been deleting these for a few days now - it clears it, then returns. Those updates didn't exist on my Win8 system. I uninstalled Hotfix KB 2598387 and that appeared to fix the problem. I have O365, Outlook 2010.